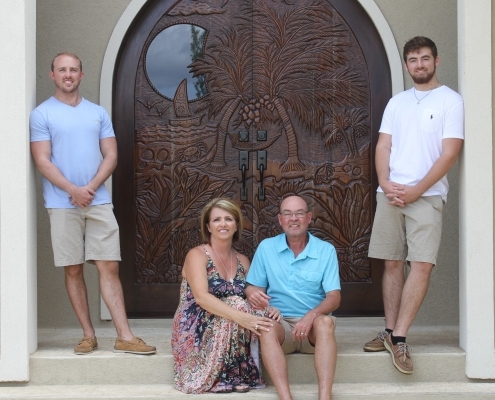 We’re Brian and Brenda Montgomery – Sirenian Bay Resort and Villas is a vision that started with our dream home. Manatee Villa (formerly known as Casa Sunsandsea) is our dream home and we’re delighted to be able to share it with you. This story has been a long time in the making. In fact, it goes all the way back to 2003, when Brian received a life-changing diagnosis. When you learn you have Stage 4 cancer and are given just six months to live, you begin to reflect on the things that are important to you. For us it was family and loved ones first and foremost – and the wonderful experiences we could share together. It was during that trying time when the idea of a beachside retreat came to us. Wouldn’t it be splendid to have an idyllic island getaway to share with our loved ones? But our dream seemed just that – a dream. Brian was undergoing treatment, and we were fighting with all that we had to hold on to him. One evening, with the lyrics of the Beach Boys’ Kokomo washing over us, we made a bold decision. We’d fight through this, and when Brian was well enough, we’d pack up our things and begin exploring the beauty of the Caribbean. That day finally came, and we were off to Jamaica and then Aruba shortly thereafter. Sitting on those postcard-perfect beaches was a turning point for us. Life was a gift. How could we spend it doing anything other than what we loved, with the people we loved, in the setting we loved? We had to make our dream a reality, no matter how challenging the path needed to get there. Years passed, and life intervened, but that dream was always in front of us, guiding us along. Then one year our travels took us to one of the most charming, relaxing beautiful place we’d ever seen. The stunning “Barefoot Perfect” beaches of Placencia, Belize. With its perfect weather, gorgeous setting and wonderful people, Placencia captured our hearts like nowhere else. We knew we’d found the setting for our dream – our forever home. It was absolutely worth the journey we’d taken to get there, and we think you’ll agree. From its foundations to its furnishings, every piece of Manatee Villa has been crafted for spending time with loved ones – for relaxing, connecting and making memories together. It’s luxurious, private and a true home away from home in one of the most relaxing settings the world has to offer. And we’re delighted to have you join our family and become a part of our story. People who know Brian well will tell you he’s a “go big or go home” kind of guy. So once Manatee Villa was completed, and with Brenda’s unwavering support, his vision just kept growing. What started as a single vacation home is transitioning into Sirenian Bay Resort & Villas – a boutique resort offering a Caribbean-luxury experience. Every detail has been considered with care, and you’ll find subtle references everywhere. Over the next three to five years, Sirenian Bay will become a destination unrivaled in southern Belize. But it’s not just about coming in and building another resort. We love the Village of Placencia and her people. The relationships we’ve built with local business owners have turned into lifelong friendships. We’ve sponsored a men’s soccer team, and love to watch them play. We enjoy being in the Village and getting to know the people who call Placencia home. We’re committed to offering you an un-BELIZE-able vacation experience but doing it in a way that supports the local economy and environment in a positive way. So take a look around – and make your plans. Because we can’t wait for you to arrive! p.s. If you’d like to learn more about Brian’s inspiring story, you can pick up a copy of his book The Nice Entrepreneur: How Leading from the Heart Can Make All the Difference.